Bolton and West Ham face an FA Cup fifth-round replay at Upton Park after the Premiership sides played out a goalless draw at the Reebok Stadium. Both teams created good chances but were let down by poor finishing. Hammers striker Dean Ashton missed the best of his side's openings, heading wide in the first half before finding the side netting after the break. Bolton's Stelios Giannakopoulos found the net in the second half, but his shot was ruled out for offside. It was an FA Cup tie of two very different halves, with all the best play coming in the second 45 minutes. Some of the sparse crowd at the Reebok Stadium must have thought they had wasted their money after a dire opening period. Bolton had the lion's share of possession, but managed only two clear chances on goal. Kevin Davies saw his close-range shot blocked by Wales international Danny Gabbidon inside the first 10 minutes, before Davies became provider only to see Gary Speed head wide from the edge of the six-yard box. The Hammers' first sight on goal came just before half-time, but £7m-signing Ashton disappointed by heading wide from Paul Konchesky's whipped cross from the left. With a Uefa Cup return leg on the horizon for Bolton, cutting down the fixture congestion appeared to spring into the Bolton players' mind after the break as they stepped up their search for a winner. But it was Ashton for West Ham, who came closest to breaking the deadlock and giving West Ham an undeserved passage into the sixth round. The former Norwich hitman met Matthew Etherington's sublime cross but headed into Jussi Jaaskelainen's side-netting. Davies came close for Bolton, but saw his shot blocked while Giannakopoulos toe-poked the ball into the net, but had his effort ruled out for offside. Allardyce's men continued to launch the ball into the West Ham penalty area in the dying minutes, more in desperation than with any well-thought out intention, but eventually had to settle for a draw and an unwelcome replay. "We have produced so much and come away with so little. There was even a chance at the end that West Ham might get a goal at the end. "We did not win the game because of our poor finishing and a goal from Stelios being ruled out when he was on-side. "We are very disappointed because we have made life difficult for ourselves because we now have to go to Upton Park which they have made a bit of a fortress." "The team kept going in what was a tough game. "We were dogged and showed attributes West Ham aren't normally associated with and we did enough to get a draw. "They are good at testing your defence but we've come away with a clean sheet. We go into the replay as slight favourites because we'll be at home." Bolton: Jaaskelainen, O'Brien, Ben Haim, Jaidi, Gardner, Speed, Giannakopoulos (Vaz Te 70), Nolan, Okocha, Nakata, Davies (Borgetti 85). Subs Not Used: Walker, Hunt, Faye. 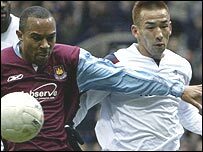 West Ham: Hislop, Scaloni, Ferdinand, Gabbidon, Konchesky, Benayoun (Dailly 82), Reo-Coker, Mullins, Etherington, Ashton (Sheringham 76), Harewood (Zamora 62). Subs Not Used: Bywater, Collins.